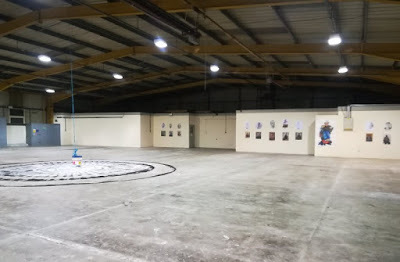 An empty Rotherham industrial building has been converted into a new creative workspace which is designed to support the work of the local arts community. 1-4 Wortley Road was vacated in 2016 by Esco Corporation, a US manufacturer in the mining, construction and industrial sectors. It is now being used as "The Factory" on a meanwhile use and is hosting its first exhibition entitled 100 Portraits, featuring the works of local artists Chris Slater and Ken Horne. The two artists set themselves the challenge of recording local life by capturing the lives of 50 local people creating a series of 100 portraits which they been producing throughout the course of 2017. In a unique twist, the duo also challenged themselves to complete each work of art within just one hour. The event has been organised through a collaboration between Rotherham Open Arts Renaissance (ROAR) and Gallery Town, a unique project delivered by a number of local businesses and organisations who came together to stimulate the regeneration of Rotherham town centre through the arts. The opening evening last weekend was sponsored by Brinsworth-based DNA Metalwork and MTL Steel and marks the first collaboration of its kind between ROAR and Gallery Town and aims to build stronger links between the town's arts community and local business owners. Aiming to showcase a diverse range of works created by Rotherham-based artists, including Rising Nipsy and the Potty Knockers, John Stanton, ILIVEINASQUARE and Jennifer Booth, visitors will also be given the chance to experience sound art, as well as purchase a range of works produced by local artists. Sharon Gill, chief executive of ROAR, said: "The launch of 100 Portraits marks the culmination of an exciting and challenging journey embarked upon by Chris and Ken. In February, they set themselves the challenge of recording daily life in Rotherham by chronicling the experiences of local residents and capturing them on canvass – setting themselves the deadline of producing each work within just an hour. "The event is the first collaboration of this kind we have entered into with Gallery Town and we are hoping the evening will be a true celebration of the contributions made by local artists. Through our collaboration with Gallery Town, we are hoping it will create opportunities for local businesses to find out more about some of the truly unique and innovative work being undertaken within the borough as well as providing opportunities for local business owners to get involved. "We feel the collaboration with Gallery Town marks an exciting step in the evolution of Rotherham's arts scene and we are looking forward to developing the relationship further in the coming months." Nick Cragg, chairman of Gallery Town, added: "There is some truly innovative and unique work which is being undertaken by Rotherham-based artists, and we believe the collaboration between ROAR and Gallery Town will help to achieve our long term ambitions of helping to stimulate the regeneration of Rotherham by showcasing the amazing home-grown talent on our doorstep. "There is a lot of synergy between the work being delivered by ROAR and the long term aims of the Gallery Town project and we are looking forward to further collaborations in future. "Art can play an enormously important role in stimulating economic regeneration, it's something which has been successfully embraced in many different parts of the UK and as home to Britain's largest open air art gallery coupled with a vibrant local arts community, we hope our work with ROAR will help to create an environment which showcases the skills of our home-grown artists whilst providing opportunities for local business owners to play an active role in helping to shape the future of our town." 100 Portraits is open daily until Saturday December 9 from 10-3pm.